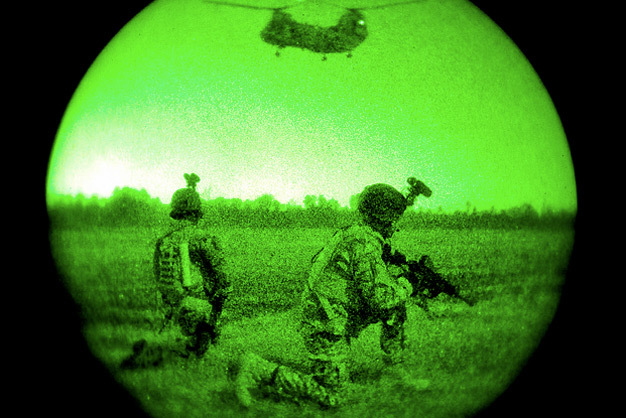 US Army soldiers conduct a night raid mission during Emerald Warrior, near Hattiesburg, Miss., on March 5, 2012. The primary purpose of Emerald Warrior is to exercise special operations components in urban and irregular warfare settings to support combatant commanders in theater campaigns. Emerald Warrior leverages lessons from Operation Iraqi Freedom, Operation Enduring Freedom, and other historical lessons to provide better trained and ready forces to combatant commanders. Photo by the US Army.